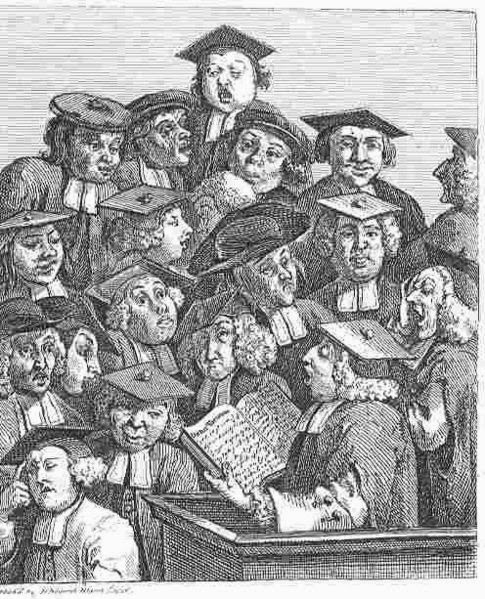 In 1736, Hogarth created a satirical print in which he ridiculed the university of Oxford. Its students were accused to be ignorant and lazy, more interested in having fun that studying. Doesn’t sound much different from today, does it? The scene is laid at Oxford, and the person reading, universally admitted to be a Mr. Fisher, of Jesus College, registrat of the university, with whose consent this portrait was taken, and who lived until the 18th of March, 1761. […] His eye is bent on vacancy: it is evidently directed to the moon-faced idiot that crowns the pyramid, at whose round head, contrasted by a cornered cap, he with difficulty suppresses a laugh. Three fellows on the right hand of this fat, contented “first-born transmitter of a foolish face,” have most degraded characters, and are much fitter for the stable than the college. A figure in the left-hand corner has shut his eyes to think; and having, in his attempt to separate a syllogism, placed the forefinger of his right hand upon his forehead, has fallen asleep. The professor, a little above the book, endeavours by a projection of his under lip to assume importance; such characters are not uncommon: they are more solicitous to look wise, than to be so. We are here presented with a motley assemblage of graduates and under-graduates of one of the universities, profoundly attending to a philosophical lecture, the subject of which is a vacuum, (or space unoccupied by matter). Dulness and stupidity seem to characterize the drowsy audience. The portrait of the person reading the lecture is said to be that of the late Mr. Fisher, of Jesus College, Oxford, of which university he was registrar. He sat to the artist for this purpose.